Hearing loops have become popular worldwide in public spaces, such as places of worship, theatres, lecture halls, and public transportation hubs such as bus and train stations. They have also been installed at bank teller windows and pharmacy counters. Connecting to a hearing loop is simple. 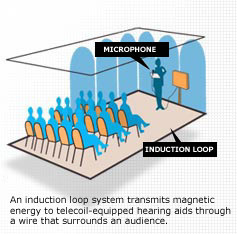 If your hearing aids offer a “telecoil” or “T-coil” option, you simply switch the program over to “T-coil” in order to activate the live stream of sound. If you are unsure whether your hearing aid is equipped with a telecoil, please visit us at Hear Care Rhode Island. Our audiologist will offer assistance with this feature. In 1990, the Americans with Disabilities Act required public spaces and businesses to offer modes of accessibility by law. For people with hearing loss, this was a landmark piece of legislation. Places as diverse as museums and movie theatres now provide devices such as infrared personal receivers to neck loops, to deliver amplified sounds with ease to the listener with hearing loss. Hearing loops are another form of assistive listening, and is growing in popularity in the US. However, it is not a widely available form of assistive listening in every state. People with hearing loss who have connected to hearing loops have praised the sound quality and the ease of function. Rhode Island is actually one of the few states in the country that has mandated hearing loop and telecoil education for people who experience hearing loss and use hearing aids to treat their hearing loss. Currently, according to Let’s Loop America, there are only three public venues in the state of Rhode Island that is known to offer the hearing loop as an assistive listening option. These three are St. Mary’s Episcopal Church in Portsmouth, RI, Roger Williams National Memorial in Providence, RI and North Kingstown Free Library in North Kingstown, RI. If you know of public spaces and venues that offer hearing loops, please send their information to update on Let’s Loop America’s Rhode Island resource page. You may find more information on hearing loops in the State of Rhode Island by clicking here and here. The Hearing Loss Association of America – Rhode Island (HLA-RI) chapter has been consistently active in discussing the installation of hearing loops. You may find more information about them here. In the past few years, advocates for hearing loops have grown in the HLA-RI. If you a frequent customer or patron at a business or venue, you should encourage the business owners to install a hearing loop. Hearing loops are the most convenient and easy to use technology in terms of assistive listening device. At the same time, if you currently wear hearing aids are and unsure whether your hearing aids offer this technology, contact us at Hear Care Rhode Island. We’ll provide you with more insight on your hearing aids’ capabilities and offer you options for new technology if you require an update.